By Andrew Kloman. Andrew is a Partner Solutions Architect (SA) at AWS. Citrix customers, did you know that you can bring your own Microsoft Windows client licenses and use them on Amazon Web Services (AWS)? This includes deploying Windows 10 on AWS for your Citrix XenDesktop deployments. Within the Studio console, Citrix XenDesktop supports the desktop deployment model called “Use hardware that is dedicated to my account”. 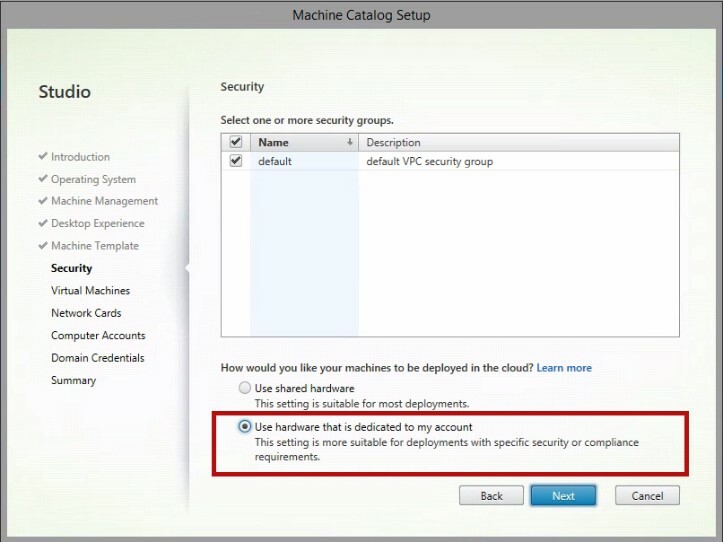 When you select the this option, Citrix XenDesktop will deploy Amazon Elastic Compute Cloud (Amazon EC2) to dedicated instances to comply with the licensing requirements of Windows 10 on AWS. Confused about what Microsoft Licensing is required? Windows client licenses may require Software Assurance or Virtual Desktop Access (VDA) in order to utilize Windows client operating systems such as Windows 7, 8, or 10 on AWS. We recommend that you read this Microsoft licensing brief for more information from Microsoft, and review the FAQ documents from AWS you can find here. The chart found here outlines common licensing scenarios when you bring your own Microsoft license to AWS. Amazon and Citrix have collaborated to offer a set of best practices and cloud migration tools to help you deploy your Citrix solutions on Amazon Web Services (AWS) faster and with higher ROI. Join us to learn how to deploy XenApp and NetScaler in AWS along with best practices and lessons learned from Citrix and Amazon. We will discuss architecture designs for Citrix in AWS with the latest Citrix Cloud solutions to help simplify a deployment of Citrix into an AWS resource location. You will also learn how Citrix Smart Build blueprints make it easy to automate the deployment of your solution. Whether you need to expand an existing XenApp or XenDesktop landscape in a hybrid cloud model, migrate to a cloud-first infrastructure strategy, or upgrade to a managed service like Citrix Cloud, Citrix and AWS have a solution for you. If you aren’t able to make it to Synergy this year and want more information about Citrix on AWS, check out the Accelerate Program for Citrix for more information. What is the Accelerate Program for Citrix? The Accelerate Program for Citrix enables customers to quickly adopt or migrate Citrix solutions on AWS. If you are running Citrix XenApp, XenDesktop and/or NetScaler on-premises and are interested in moving to the AWS Cloud, then this could be a really interesting offer for you! In cooperation with Citrix (an Advanced APN Technology Partner), we have assembled an AWS Accelerator to help you to plan and execute a successful trial migration while using your existing licenses. The migration process makes use of Citrix Smart Tools. Smart Tools includes a set of proven deployment blueprints that will help you to move your existing deployment to AWS. You can also deploy the XenApp and XenDesktop Service on Citrix Cloud, and in conjunction use Smart Tools to manage your AWS-based resources. What is the Trial Period funding and how does it work? To provide a controlled trial or migration period to customers, AWS and Citrix are offering a customer trial package for 60 days. For each customer nominated and approved, they will receive $5,000 in AWS Promotional Credits, Citrix XenApp and/or XenDesktop software for up to 25 Citrix users for up to 60 days along with Citrix Smart Tools with AWS Smart Build Blueprints and Smart Scale auto scaling. Questions? Contact AWS (email us) or submit a request with Citrix (registration form) and ask to join the AWS Accelerator.